Our 2 acres of trees and lawns make a nice setting to relax. There is a picnic table and gas barbeque by each kitchen unit. There are 3 playgrounds on the property along with horseshoes, ping pong, badminton, volleyball, bocce ball, large tubes for jumping on and a trampoline. The Cabins are very large units with full kitchen facilities, bathrooms with tub and showers, separate bedroom with queen or twin beds (cabins sleep 4 to 5 comfortably). We have 2 sleeper units without kitchen, with one queen bed and one single bed, shower and fridge. All bedding, towels and dishes are supplied. All you need is your food and beach towels! Each cabin has a colour TV with cablevision. Cribs and cots are available upon request. Free, full size propane barbeques are available to use right outside your door. 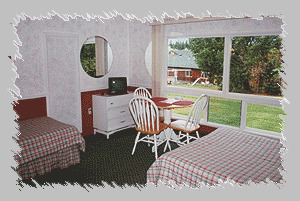 Please visit Shuswap Lake Motel & Resort Website.